At 22 weeks of pregnancy you will most likely be feeling your baby’s movements and kicks much more frequently and they may be more significant kicks than a when you first started to feel movement. But you may not know that you can actually feel your baby’s hiccups!! Hiccups are much more rhythmic than other movements and feel differently to kicks and rolls. Your baby’s developing muscles allow him/her to move around inside your womb and be very active. Because of the small size of your baby at 22 weeks he/she can swim up and down inside you and be in any position, at any time. Feeling your baby move within your womb is a wonderful part of pregnancy, unfortunately there are many side effects and changes to your body that aren’t so much fun. Metabolic changes during pregnancy include your thyroid gland becoming more active, this can mean that you may perspire more heavily than normal. When exercising you may feel short of breath, for more information on exercise during pregnancy see Exercise Information in the menu. Other minor complaints at this stage of pregnancy can include tender gums that feel spongy, generally due to hormonal influences. Constipation, heartburn and bladder infections can also cause many pregnant women discomfort. Constipation generally happens during pregnancy due to progesterone relaxing the muscles in the intestinal walls. This means there are fewer contractions to push food along; therefore much more water is absorbed from the stool in the colon, making it hard and dry. Some ways you can combat constipation is by increasing your fibre intake in the form of fruit, vegetables and whole-grains. Also drink plenty of water and try to walk briskly for 20 minutes a day. Always consult your doctor before taking laxatives; natural laxatives are a healthy alternative. Due to an increasing amount of blood and hormones circulating in your body during pregnancy your skin may have a positive or negative effect. 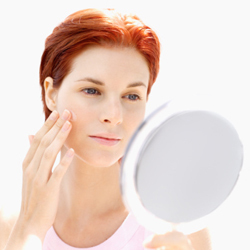 You may have a fuller face and glowing complexion that people so often comment on during pregnancy. However on the flipside you might be experiencing breakouts and experiencing acne like when you hit puberty in your teens. Your skin will return to normal after the birth and possibly even sooner, with your skin clearing in the third trimester. At 22 weeks of pregnancy your baby now measures approximately 27cms from crown to heel and weighs about 430 grams. Your baby is also looking much more proportionate and like a mini newborn baby! In past weeks your baby’s head has been large in comparison to the rest of the body, however as development continues your baby is looking more formed every day. Your baby’s heartbeat can now be heard by less sensitive stethoscopes, the eyebrows, eyes and eyelids are now well developed, ears are formed and can hear your conversations, even finger nails cover the fingertips! Hidden in your baby’s gums, “baby” teeth or tooth buds if you like, have started to form at 22 weeks of pregnancy. Remember you have that joyful teething stage to look forward to soon after your baby is born! Just like during pregnancy, there are good and bad times when your baby joins the world, however we wouldn’t trade them for anything!